Beyond 2015: MA's National Conference was a great success! 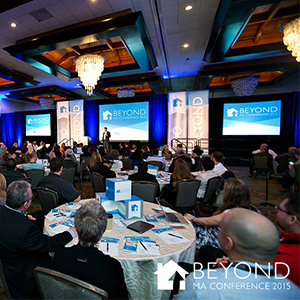 Over 200 MA brokers, partners and staff congregated in sunny San Diego, California from February 26-March 1 for Beyond 2015, Mortgage Architects’ National Conference. Held over three days at Paradise Point Resort situated on San Diego’s scenic waterfront, Beyond kicked off with a team-building event on Thursday, February 26. Set seaside, the inaugural MA Chef’s Challenge pitted 15 teams of 10 brokers against each other to see who can make the best salsa and guacamole with a kicker – a special secret ingredient. Although things definitely heated up competition wise, the Chef’s Challenge provided a unique and fun way for MA brokers and staff to reacquaint and kick-off the conference. The following day, Beyond 2015 officially kicked off with opening remarks from MA’s VP of Operations, Dong Lee and a short video showcasing a few MA brokers discussing how they have gone “beyond” personally in their careers at MA. Day 1 was a full day of learning, thoughtful discussion and inspiration thanks to presentations by industry leaders Jim Smith of Scotiabank and Rudy Naraine of Teranet/Purview, a broker panel moderated by Scott Peckford, and finally a inspirational talk by renowned motivational speaker Warren Macdonald. Immediately following the end of day 1 of the conference was another opportunity for conference attendees to connect and network with the Home Trust-sponsored Seaside Cocktails. With no other official conference-related events scheduled in the evening, many conference goers took the opportunity to explore the local area and visit Downtown San Diego and La Jolla with transportation sponsored by Genworth Canada. Day 2, the final official day of the conference also started off on another energetic note and provided more opportunity for conference attendees to gain industry insights and inspiration from the variety of speakers including industry leader Agostino Tuzzi of Genworth Canada and Day 2’s headliner speaker Clay Clark. The conference proceedings completed with a closed session led by Pacific Mortgage Group CEO Ron Swift and MA President Albert Collu. To cap off Beyond 2015, immediately following the closed session, everyone set sail on the D&H sponsored Hornblower Cruise, a harbor cruise that showcased the scenic beauty of San Diego as the sun set over San Diego and also Beyond 2015. To see all the action for yourself, you can view photos from the conference on the Our Mortgage Architects’ Facebook page ( https://www.facebook.com/MADoYouWantMore ) or our Flickr page ( https://www.flickr.com/photos/129961287@N03/sets/) or conference videos on YouTube ( https://www.youtube.com/user/mortgagearchitects ). Thank you all those who attended the conference and to the generous sponsors, without whom the conference would not have been the success it was. Hope to see everyone at the next one.